Nestling on the inside of Fairlie Quay, this small vessel has recently been tendering to SEALAND PERFORMANCE at anchor off the north end of Great Cumbrae. LYRAWA BAY was built in 1970 as a Faroese ferry, and was originally named SAM. She was purchased by the Orkney Islands Shipping Company in 1976 and after being renamed and converted to suit their purposes, she served the South Isles (Hoy and Flotta) from Stromness for a number of years, later becoming a relief ferry. Sold in 1991, she later became a fishfarm workboat, and was subsequently rebuilt extensively, now bearing little resemblence to her original profile. LYRAWA BAY, still retaining her Orcadian name, was more recently acquired by Offshore Workboats, although I am not sure if she is still owned by them or not. I think one of your dates is wrong. I crossed to Hoy on the Lyrawa Bay in July 1990 whilst on holiday. I think it was sold by Orkney Island Ferries about 91 or 92 after the Thorsvoe was launched. Also, the ro-ro services to Hoy & Flotta depart (and have always done as far as I'm aware) from Houton about 5 miles south east of Stromness. Apologies - LYRAWA BAY became relief vessel in 1986, and was not sold until late in 1991. When she was the South Isles ferry, she did not start using Houton until 1983, when the ro-ro terminal was built there. Prior to that, she had operated from Stromness, and also Scapa, using a crane to load in the days before linkspans were installed. 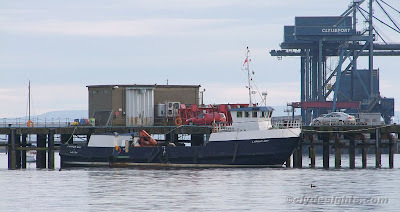 The arrival of GEIRA from the Shetlands in 1986 (she was renamed HOY HEAD the next year) meant that LYRAWA BAY was able to stand down as the principle Houton/Lyness/Flotta ferry. Hi John, she is owned by Offshore Workboats, on charter to Svitzer.